Having Teddy at Hidden Hollow in Upperville means that now my route often takes me past Llangollen, an incredibly beautiful estate that sits at the foot of the Blue Ridge Mountains, about five miles from my home. Llangollen has a rich history but is most famous for being the home of Liz Whitney Tippett, a renowned horsewoman of the past century who was widely known for breeding top-class Thoroughbreds for flat racing, steeplechase, showing and foxhunting. It’s now home to the Brennan family, who own and operate a successful polo operation. Llangollen was also owned by Roy L. Ash, of Litton Industries fame, who purchased it in 1989, saved it from developers and restored it to its former glory. Mr. Ash also owned Huntland at the time, another run-down historic farm he helped to save and restore. I lived in the Kennel House at Huntland in the mid-1990s, and some of my fondest memories are of the many years I spent there on that lovely estate. While driving home from the barn today I got stuck behind a tractor near Llangollen, so I took the opportunity to take a few photos. This majestic tree near the Llangollen driveway has always impressed me and is another “favorite” tree I admire on my commute. Wow what a beautiful place and it is nice to know that the farms were saved from development. 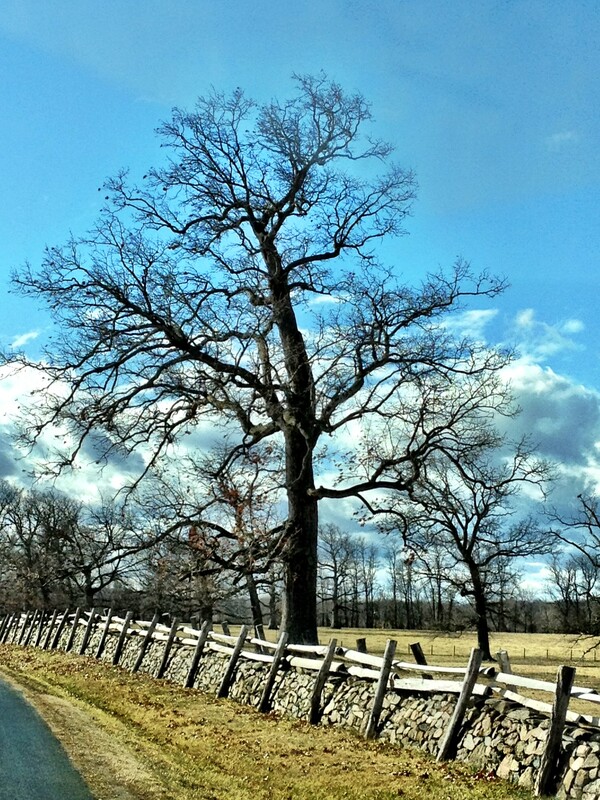 Love the fence/wall and the neat old tree! That is a strong and beautiful tree. I love how it seems to bend over towards the road. The whole place feels serene and almost untouched – despite the fact that it’s obviously a developed piece of land. The name Llangollen suggests some connection with Whales – or I am wrong?